But their numbers were lower than in previous weeks, with some perhaps appeased by Macron's promises, while others may have been deterred by cold, wet weather or shaken by the terror attack earlier this week on a Christmas market in Strasbourg.By midafternoon Saturday, about 34,000 protesters had turned out across France, including more than 2,000 in Paris, according to the Interior Ministry. Last week, some 77,000 protesters turned out across the country, including 10,000 in Paris.Paris police estimates earlier Saturday put the number of protesters in the capital at several thousand.Some 69,000 police officers were deployed across the country in anticipation of the protests, including 8,000 in Paris, the Interior Ministry said.Police used tear gas on the Champs-Elysées in confrontations with protesters. Some were seen throwing rocks at security forces.More than 100 people were in police custody for questioning early Saturday, Paris police said, much fewer than last week. 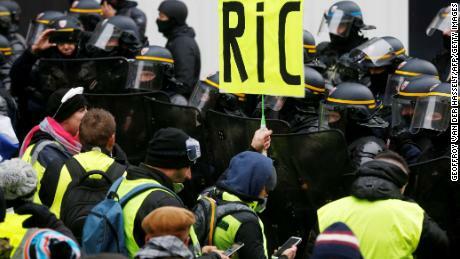 The protests are named after the yellow high-visibility jackets French motorists must carry in their vehicles.Paris department stores such as the Galeries Lafayette and Printemps are open this weekend as well as the Louvre museum and Eiffel Tower. Parts of the Champs-Elysées also reopened to traffic midmorning Saturday.Speaking to CNN French affiliate BFMTV, Maxime Nicolle, a spokesman for the "gilets jaunes," called for a citizens' referendum. "We are protesting peacefully, but Mr. President give us back our freedom and our sovereignty!" he said. The protesters held a moment's silence at the Place de l'Opéra for those who have been killed since the movement began.Authorities in northern France confirmed that a man died Friday evening in a car accident in Erquelinnes, Belgium, following a blockade by "yellow vests" near Jeumont. On December 8, many Paris tourist hot spots and stores were shuttered in anticipation of violent protests after the previous week's demonstrations resulted in the worst riots to hit the French capital in decades. By the end of last weekend, 1,723 people had been taken in for questioning and 1,220 into custody, according to the Interior Ministry. 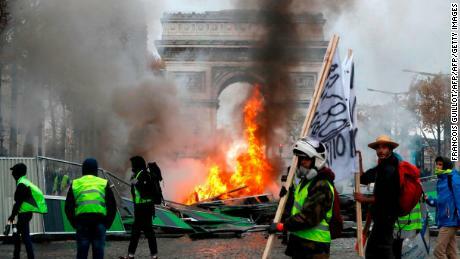 Across the country, 135 people were reported injured.Under increasing pressure to respond, Macron may have taken some of the heat out of the protests when he pledged Monday night to increase the minimum wage and scrap new pension taxes. In a televised address to the nation, Macron said the violent protests — which have morphed from a grassroots movement against fuel tax hikes into disparate demonstrations against his presidency — have been "unacceptable" and "will not be in any way indulged. "He proposed some social reforms, including an increase in the minimum wage by 100 euros ($113) a month beginning in January that will not cost employers extra and a promise that overtime hours will not be taxed. Macron also remained defiant and said he would not reinstate the wealth tax but would fight tax fraud. Journalist and political commentator Agnès Poirier told CNN that the anger felt by protesters, many of them lower middle class from more rural areas, remained "profound." But she said the measures announced by Macron — and his televised appearance during which he seemed more humble and heartfelt than before — may have swayed some people. 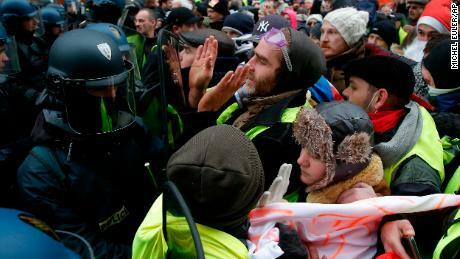 "We will see if the French are still supporting the movement, but also if the 'yellow vests' are ready to stop demonstrating and structure themselves," said Poirier, referring to the grassroots nature of the movement, which has no leadership and has largely been organized through social media. "They need to structure themselves to meet with the government and go to the table to start negotiating." The reforms are expected to cost the government between $8.1 billion and $10.1 billion, Olivier Dussopt, France's secretary of state to the Ministry of Public Action and Accounts, told BFMTV.Macron visited the Christmas market in Strasbourg on Friday evening to express his gratitude to members of the emergency services after this week's deadly attack there. Police killed the suspected attacker Thursday evening in the city following a two-day manhunt. Four people have died following Tuesday's attack. CNN's Saskya Vandoorne reported from Paris and Laura Smith-Spark wrote from London. CNN's Sandrine Amiel contributed to this report. The European Commission is investigating whether Google has done enough to resolve concerns that led..
(CNN) — From blended wing airliners powered by nuclear fusion to a new generation of spacecraft desi..